Run air tools on the trail! With a never-ending supply of air onboard, you never have to look for a re-fill, or worry about running out. Air pressure gauge - 160 psi. 20 ft. freeze resistant 12 gauge wire. (110 psi on / 145 psi off). one safety valve (175 psi). a 4" continuous grommet strip. .
With this kit, we put together every component needed for an onboard air system. We installed it and tested it on our trucks, and we love it. 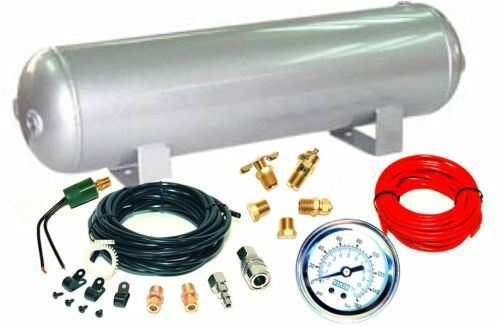 If you already have one of our air compressors, you can upgrade your system and augment it with our complete onboard air kit. Or order one of our listed compressors, and have the onboard air kit shipped with it at no extra freight cost. 21/2 gallon air tank with six 1/4" ports. 5 gallon air tank with four 1/4" ports. 10" X 53/4" mounting bolt pattern . Total . $189.95 . $209.95 . If you want to build your onboard system separately, this air tank is a perfect addition. .
Our 21/2 gallon or 5 gallon air tank will fit almost anywhere on your vehicle - bolts easily to a spare tire carrier. We've also seen it mounted under the vehicle between the frame rails. .
Total . $74.95 . $89.95 . 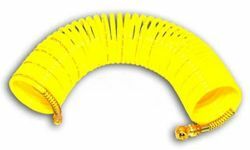 This 200 psi rated 35 ft. coil hose will even reach all four tires on your buddy's vehicle parked alongside. Just the right length avoids overstretching the coil hose and without the clumsiness of a 50 ft. coil. This hose comes with swivel tire chuck and 1/4" male swivel fitting. .